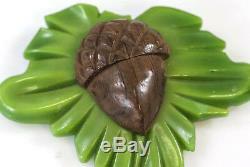 Vintage 1930s BAKELITE & Wood BROOCH - Large 3 Nicely Carved Art Deco COSTUME JEWELRY PIN. 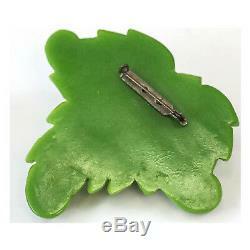 Vintage 1930s BAKELITE & Wood BROOCH. 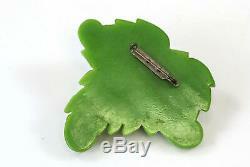 Large nicely detailed Art Deco costume jewelry pin. 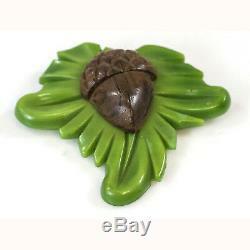 Estate jewelry find, the brooch is a vibrant green carved bakelite oak leaf with a carved brown wood acorn set atop. Pin back clasp on reverse. Measures 3 inches x 3 inches. A great piece to add to your jewelry wardrobe or vintage Bakelite, thermoset plastic, jewelry collection. There is a small fault that can only be seen on/from the back (see photos), down near the bottom, lower portion of the brooch. It is not substantial by any means and is quite shallow, really not much deeper than a scratch, with the structural integrity of the brooch not appearing, or feeling, affected at all. & Check Out Our Other Items. 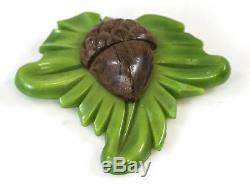 The item "Vintage BAKELITE & Wood BROOCH Large 3 Nicely Carved COSTUME JEWELRY PIN 1930s" is in sale since Thursday, March 7, 2019. This item is in the category "Jewelry & Watches\Vintage & Antique Jewelry\Costume\Bakelite, Vintage Plastics\Pins, Brooches".d" and is located in Niagara Falls, New York. This item can be shipped to United States, Canada.